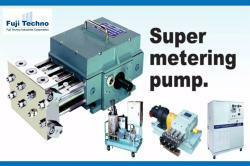 Super Metering Pumps are precision instruments for feeding liquids accurately, at pre-determined volume, into a process or system. 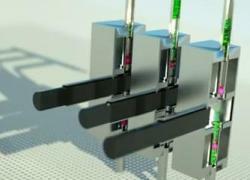 The accuracy is essential for applications such as micro-reactors and continuous flow reactors. The FUJI-Industries Super Metering Pumps offer precise delivery of liquid without the occurrence of cavitations (pulsation). A specially designed cam box makes the total amount of liquid discharged from three cylinders always constant. The three plungers are designed to make different motions in six stages within one revolution of the cam. Due to the design, movement of the valve ball is so smooth that pulsation and leakage do not occur. As there is little abrasion of the valve ball and valve seats, high precision can be maintained for a long period. If you feel that Super Metering Pumps may benefit your process or application, please contact us for a chat.